Let’s explore the best flea markets in Paris. Paris’ flea markets are treasure troves of vintage items, second hand trinkets and miscellaneous bits and bobs. Each flea market has its own distinctive feel and price range, but with just a little bit of INSIDR savoir-faire you will enjoy navigating these markets like a pro bargain hunter while you visit Paris! Looking for more ideas on how to spend your days in Paris? You must download our Free 4-Day Paris Itinerary! This Parisian flea market is definitely one of the best flea markets in Paris. Dating back to 1920, it consists of 15 different markets, covering 7 hectares. You can easily spend a whole day exploring this immense flea market which evolves greatly as you walk through it; from the rough-around-the-edges markets filled with tat, but where you can find some hidden gems if you’re prepared to dig around, to a world of upmarket antique stalls with an almost museum type of ambiance. This market, the biggest flea market in Europe is great fun and you can be sure that you will leave with some interesting and unique finds! It is definitely one of the best flea markets in Paris. Everything! This is the largest flea market in Europe, which composes of many smaller markets, so you can be sure to find everything; from vintage clothing, to furniture of all kinds, art, cheap knock-offs, cutlery, jewellery, toys etc. This market is so eclectic it would appeal to everyone; from the avid art collector to a bargain hunter looking for some 50’s vintage clothing! Prices really range, you can pick up tickets and vintage clothes very cheaply in Marché Vernaison, but you can also find expensive antiques in Marché Paul Bert et Serpette! When does the Saint Ouen flea market take place? How to get to Saint Ouen flea market in Paris? We suggest you to get off at the Garibaldi station instead of Porte de Clignancourt (because it’s a longer walk from this station) just cross the park on the right side of the big church and you will arrive on Rue Des Rosiers the main street where you will find most of the nicest markets. If you come from the Porte de Clignancourt station, cross over the boulevard périphérique (Ring road) to the north. Be careful Porte de Clignancourt is a maze, with a lot of construction works and often crowded. Saint Ouen is definitely one of the best flea markets in Paris, but it’s not as fancy a place as Place Vendome or Champs Elysée. Be prepared! How to make your visit to St Ouen flea market special? Looking to make your visit one of a kind? The INSIDR team was invited to explore the Saint Ouen flea market with the Localers‘ tour company. We explored the market for 3 hours with a very friendly local guide who has been living in the area for 20 years and really knows the market like the back of his hand! The sunny weather and Eric’ incredible stories about the area made this visit perfect! We loved it so much that we have negotiated a special discount on their tour to make sure most of our INSIDR travelers can benefit from it too! Get 10% off your tour when booking online using the code “INSIDR”. Click on the points marked out on the map for some useful information and tips! Les Puces de Vanves is an antiques flea market where you can find antique objects from the kitsch, the classic and everything in between. It’s definitely one of the best flea markets in Paris. Furniture from the 18th, 19th, Art Deco period and the 50’s and 70’s, garden furniture, lighting, table decoration, cutlery, vintage jewellery and cameras, military medals, old post cards, religious ornaments, Oriental and African art. Who would love Vanves flea market? Antique fanatics – There are 380 traders who sell a vast range of antique items from different time periods. What are the price ranges at Vanves flea market? On the whole, this more expensive than some of the other flea markets. However, you can still pick up a bargain if you know where to look! When does the Vanves flea market take place? Takes place every Saturday and Sunday: 7am- 1pm. The Vanves flea market is taking place on saturday and sunday, which is a special day in Paris as many areas are off. We have compiled a complete guide to Sunday in Paris. How to get to Vanves flea market in Paris? Take metro line 13 until Porte de Vanves station and get off, and walk South for 5min. The exact location of the market is 18 Avenue Georges Lafenestre, 14th arrondissement. For more access information, read our guide on how to use Paris metro. Less well- known and less glam, but also off the tourist beaten track than its counterpart in St-Ouen in the North, the Montreuil flea market is where you can steal a real bargain. From vintage clothes, to old cutlery and shabby furniture, this market sells an eclectic selection of bric-and-brac goods. Be prepared to do some real rummaging to find what you’re looking for as there is a fair amount of junk, but hey, what is considered one man’s junk, is another man’s treasure! There is definitely scope to haggle at this market, so don’t hold back in trying to bag a good deal! It’s definitely on our list of the best flea markets in Paris. In short, a bit of everything! That’s why it’s one of the best flea markets in Paris. Who would love the Montreuil flea market? Montreuil is one of the best flea markets in Paris for bargain hunters! It is possible to bag a bargain here, but you have to be prepared to rummage around and haggle! Vintage lovers- They have a wide range of second hand clothes, the quality may be questionable, but if you hunt hard enough, you’re sure to find a gem! What are the price ranges at Montreuil flea market? Prices really range, you can pick things up for just a few euros. You will have to hunt for the bargain pieces! When does the Montreuil flea market take place? Takes place every Monday mornings from 7am- 1pm. Montreuil flea market can get extremely busy, be careful with your belongings when you are there and try to blend in as much as possible which means not looking too much like a tourist. 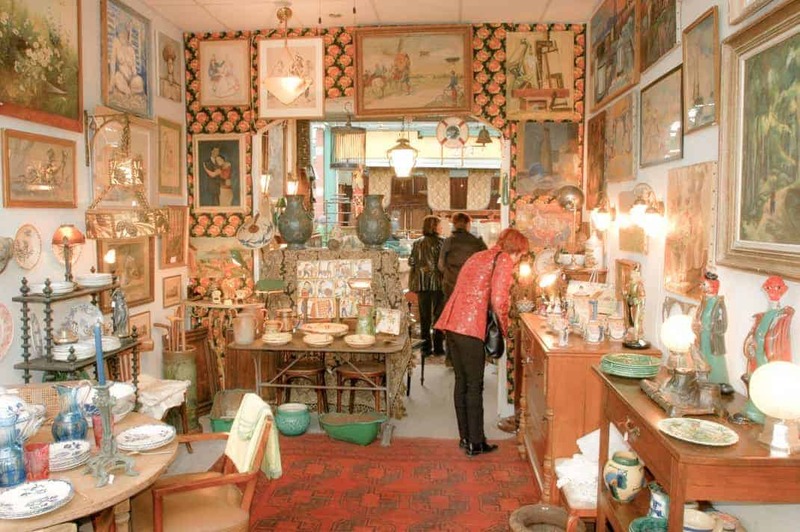 How to get to Montreuil flea market in Paris? You can easily reach Montreuil flea market by getting off at Porte de Montreuil station on line 9. Once you are outside, just follow the crowd! Exact location is Avenue de la Porte de Montreuil, 20th arrondissement. It’s convenient location makes it one of the best flea markets in Paris. Click on the points marked out on the map for some useful information and tips on one of the best flea markets in Paris.